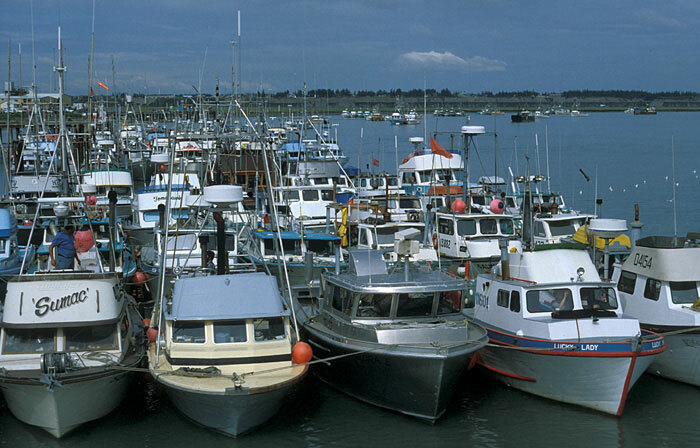 The Alaskan salmon fishing fleet is composed of mostly small vessels. During salmon season many of the harbors are so full that there are not enough places for the vessels to tie up to the docks. When this happens many of the vessels 'side tie' to each other. This means that to get to the outermost vessels the fishermen must walk through other vessels 'side tied' together. If someone in the middle wants to leave they must rearrange all the other vessels to the outside of where they are located. Most of the Alaskan salmon are taken during the summer months as the fish return to their streams for spawning. In the United States it is Alaska that supplies ninety-five percent of the commercial salmon harvest. 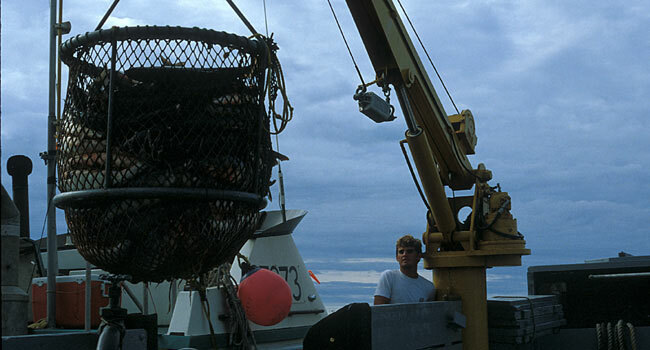 Gillnets are a common means to catch salmon in the North Pacific. In general these nets are set in the ocean according to the permit held by the fisherman. The net is set so that it hangs (like a curtain) between two buoys for driftnets and so that one end is attached to a buoy and the other to the shoreline for setnets. The surface line has floats to keep it at the top. Salmon swimming by do not see the net and swim into it, catching their gill cover in the net. 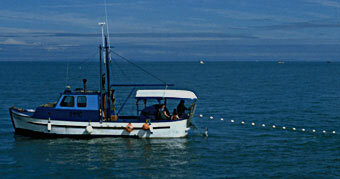 Landing the salmon from a gillnet involves winding in the net and removing the fish as the net comes onto the vessel. Most of the vessels wind up their nets on big drums located at the rear of the vessel. This way the net is ready for redeployment for the next set. Gillnetters primarily land sockeye, chum and coho salmon. 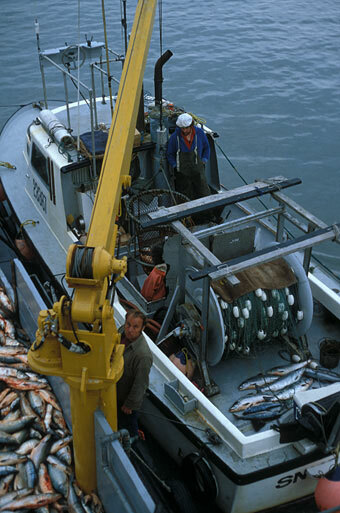 Purse seining is another method used to catch North Pacific salmon. In this case a large net is set in a circle. It is similar to the gillnet in that the top of the net has floats and stays at the surface. The net itself hangs down like a curtain (in this case a circular curtain). The bottom of the net is weighted, to stay down, and has a 'purse line' that can be pulled to close the bottom of the net. In this fishery the fish are encircled with the net, the purse (bottom) is drawn, and the entire catch loaded onto the boat by heavy machinery. This fishery targets the numerous pink salmon as they return to shore. Trolling is used to catch only about two percent of the Alaskan commercial salmon. In this fishery poles pull long weighted fishing lines that are rigged with baited hooks. Trollers get primarily Chinook, coho, and pink salmon. 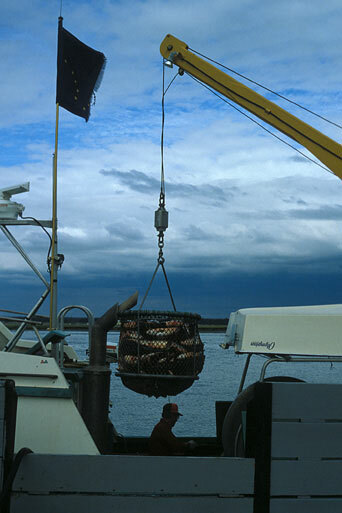 Bringing the salmon in for processing may be done by each vessel separately. In this case the vessel must take time out from fishing to run into shore and offload the salmon. Some of the larger vessels contract with another vessel to stop by, offload their catch and bring it in. These 'tender' vessels allow the fishermen to keep on fishing but add an additional cost to the product. Regulation of salmon fishing in Alaska is highly controlled. Salmon fishing permits are given to individual fishermen and there is a limited number of permits issued for each type of fishery. Almost half of the non-governmental jobs in Alaska are in the fishing industry and salmon fishing is about one third of entire fishing industry. Over the last twenty years the State of Alaska has carefully managed its salmon fishery - issuing a limited number of permits, opening the fishing days and times to allow for both profitable fishing as well as successful reproduction for each species. If a species is having a particularly bad year there may be only a few hours of fishing allowed. Since 1980 Alaskan salmon catches have been increasing and their salmon stocks have been steadily increasing. The Alaskan Department of Fish and Game is responsible for managing the salmon fisheries and the Alaska Board of Fisheries allocates the salmon yield among the users. This combination of two agencies seems to have produced a win-win situation for Alaskan salmon. 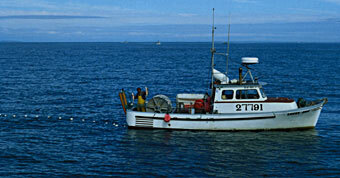 Sport-fishing for salmon occurs on ocean-going sport-fishing boats as well as in stream and rivers. The ocean sport-fishing is primarily for food and is usually seasonal, occurring only when the salmon are returning to reproduce. The sport-fishing in streams and rivers is often just for catch and release as many of the salmon are mushy by the time they are caught. Although the digestive tract of the salmon is no longer functioning, many salmon species will still strike at hand-tied flies in the streams - as if they were eating. This makes for a fun sport for some anglers. Pinks, sockeye, coho and chum all are known to strike at flies. Coho are especially interesting as they are known to jump high out of the water while striking at a fly. The reason for this is unknown but it provides endless hours of entertainment for the patient fisherman.